If 95% open rates sounds like fiction to you, I understand. Read on and you will see why it's very real and how it can help you sell more in less time. I'm talking about using a Chatbot to supplement your email marketing business. You see, today's chatbots are newbie friendly, affiliate friendly, and easy for anyone to use, even those who do not have tech skills. And goodness, do they ever work! 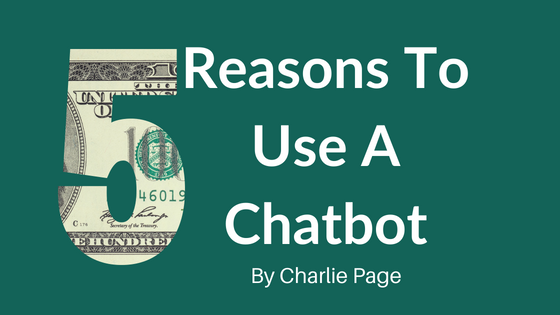 For now, let's look at five compelling reasons to use a Chatbot. I'm not talking about a button that opens a popup window. I'm talking about your visitor pressing one button only and having your lead magnet delivered to their computer instantly. Look at the image below as a perfect example. This is from the king of Chatbots, Andrew Warner. Notice the white arrow. Once I clicked that box the information was on my computer in seconds. Automation is easy to understand but harder to use. It's a computer program of some sort (autoresponder, chatbot) doing the work for you. You build automation once and profit from it many times. Sweet! Chatbots do not disappoint when it comes to automation. You can type directly into your chatbot if you like (much like sending an email broadcast) or you can schedule as many messages as you like into the future, just like an autoresponder follow up sequence. This means time freedom as you let the chatbot do the work of selling. Just look at how that works. Here is a sample follow up sequence from a chatbot. Person visits your page and opts-in to your chatbot with one click. A message is on their computer instantly thanking them and asking them a question. They answer the question and the thing they want (like a lead magnet, an order form, or scheduling an appointment) is provided instantly. The person then takes action on what the chatbot delivers and either buys, gets more information, or one of 100 other actions you want them to take. Know this - unlike email, chatbots can take your customer from being mildly interested all the way through the order form process automatically. This is the future of selling online. Why can I say 95% open rates with integrity? Because my research shows that this is what is happening right now. And it will likely continue. You see, when a person enters their email address in your opt-in form there is a delay. Even if the email takes only seconds to arrive, they have to open their email program and read it. And your email will be mixed in with 100 other distractions, all vying for the attention of the reader. With Chatbots, you have as close to a one-to-one conversation as can be had without being on the phone. Very much like texting, Chatbots create shorter but more intense interactions. And many can end up in a sale. People engage with chatbots more than email for a very simple reason. We are programmed to believe that the people who send us selling emails will not respond. I get emails every day from people who reply to my outgoing business email messages. They are almost always shocked that I reply personally. Some companies and individuals actually put use a "non monitored" address so you can't reply and continue the conversation. Contrast that to a real-time chat (just like texting) where the chatbot is delivering instant answers. Many consumers will keep asking questions as long as the answer comes quickly and is accurate. Chatbots do this automatically for you, 24 hours a day, all over the world. You can't be in Memphis and Malaysia at the same time. Chatbots can deliver digital files, take orders, answer questions, and much more. How much you want a chatbot to do is up to you and depends on your circumstances. If you are an affiliate, a chatbot on your blog can answer questions, get the person to click your affiliate link, and even direct them to the order page. If you own your own product and process your own orders, your chatbot can literally take orders in real time. If your sales funnel includes using a lead magnet (and it should) imagine the difference between these two situations. A person opts-in and needs to confirm their email address. They receive the verification email and confirm their address. They then receive another email with a link to the lead magnet. They click the link and download the lead magnet. They open and read or watch the lead magnet. Time involved - about 10 minutes. Now with a chatbot running the show. A person opts in with one click and receives an instant reply on their phone or computer. They click yes and the lead magnet is delivered to them instantly. Time involved - about 15 SECONDS. Distraction level - almost non-existent. Chatbots are wide open right now. Consider these facts. Bigger retailers, like Sephora and Macy's are on board. Huge marketers like Digital Marketer are using chatbots. Almost no affiliate marketers are using chatbots at this time. Chatbots are now easier than ever to build. Even if you have low tech skills (or no skills) sites like Bot Academy teach you how its done. No, they will not. But they are a great supplement to email and that's how we should use them. 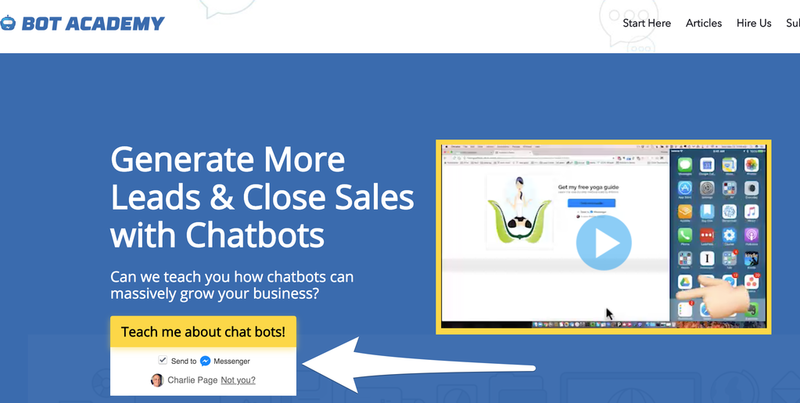 CHATBOT BONUS FEATURE: If you are an email marketer like me, you can get the email address from the chatbot user with one click. And get this, because it is important. The email you get will be their Facebook email address, not some fake address they use to get free lead magnets. On balance, learning more about chatbots now is smart. Very few are using them and the technology will be around for a long time. Plus ... they are so much easier to set up and use now than they were a year ago. There are even suppliers who will do the entire job for you for a reasonable fee. Add a chatbot to your marketing and watch as multi-dimensional marketing (remember that term ... it is important) takes your business to new heights. More free time and more sales too? Sounds like a beautiful thing to me! P.S. Want to know more about how to use chatbots? Contact me at support and let me know. Great article! Definitely interested in learning how to build one! Thanks Roberta! Always great to hear from you. I really ENJOYED reading this post, and the golden nuggets you managed to squeeze in were definitely an eye opener for me! Oh YES, Charlie – I would VERY MUCH like to get more information about chatbots!!! ~ John (A Swedish Dude With A Great Passion ? for Doggies). ?? Thank you for letting me know. I will be sharing much more in the coming weeks. Yes, Charlie, I would like to learn how to build a chatbot. I’m working on that post now. Should be ready next week.